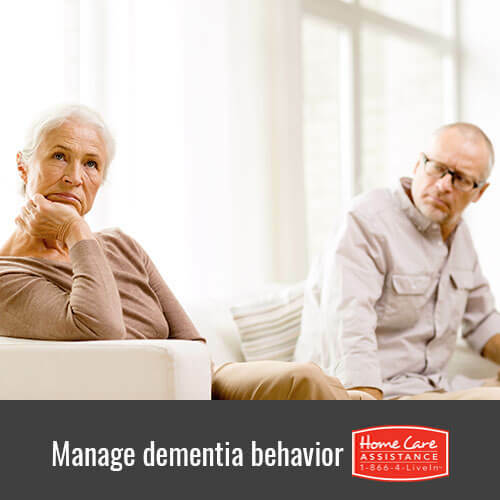 If you provide home care for a senior loved one with dementia, you’ve likely encountered some challenging behaviors. Although it’s easy to feel frustrated or even defeated, here are a few things you can try. Flare-ups can take the form of repeating a question or action. It’s usually a sign of insecurity, so look for the emotion behind the repetition. If your senior loved one is frightened, try to reassure them. If they’re fidgeting, give them something purposeful to do, such as watering plants or setting the table. Ask questions to facilitate conversation. Just be sure to pose only one question at a time. Try a closed-ended approach, prompting a simple “yes” or “no” reply. Wait patiently for a response. If there’s an impasse, coax conversation through the suggestion of words. Offer a choice. Pointing to an object may help, and be sure to only offer one other choice at a time. Observe body language and non-verbal cues. Listen for the feelings behind actions. Behaviors can intensify in the early evening. This is termed “sundowning.” It can be due to fatigue and the onset of shadows and darkness. To assuage sundowning tendencies, make late afternoons as relaxing as possible. Ensure a predictable evening routine, and keep rooms well-lit until bedtime. Of all the things you can convey, the assurance that “I’m here” may be the most appeasing. Remember, too, that your local Rhode Island home care agency is here with you. We’re all in this together. If you are the primary caregiver for a loved one with dementia and could use help managing his or her care needs, Home Care Assistance is here. In addition to comprehensive dementia care, we also offer Alzheimer’s, stroke, and Parkinson’s care Rhode Island families trust, ensuring seniors have all the support necessary to remain safe in the comfort of home. Give us a call at (401) 284-0979 and schedule a complimentary consultation with a dedicated Care Manager.